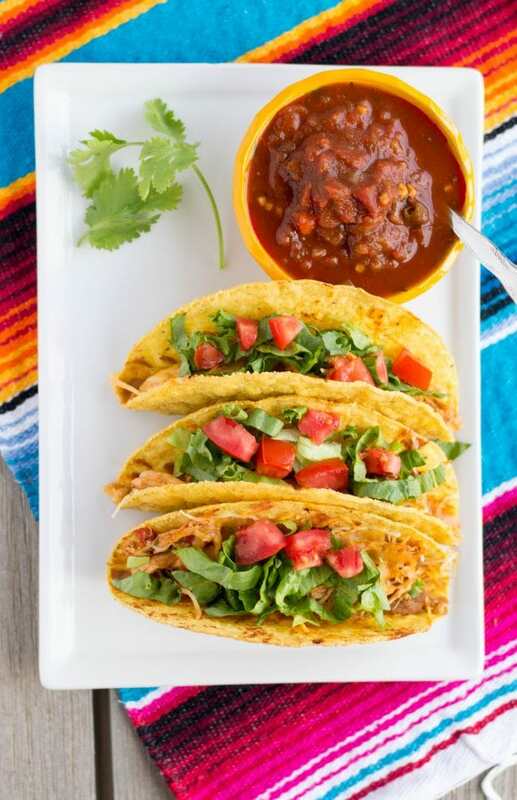 I posted this fast and easy Instant Pot Salsa Chicken the other day, and with that I made crunchy tacos. I have the larger Instant Pot, but if you don’t need to make large meals than this smaller one would be perfect. This entire meal took 30 minutes to make and that’s including cooking the chicken. Not bad for a weeknight meal that the whole family enjoyed! If there’s one thing my family will eat, it’s tacos, and who can blame them?! These crunchy tacos are reminiscent of a famous fast food joint, and that’s probably why my kids liked them so much! At least I opted for healthier ingredients to make it more nutritious. I used Crunchy Taco Shells from Trader Joe’s, and placed a spoonful of canned re-fried pinto beans on the bottom and spread it along the shell. Then I added the shredded salsa chicken, and a sprinkle of shredded Mexican cheese blend. I was able to fit the 12 taco shells in a 9 x 12 baking dish and arrange them to say upright. The tacos are baked in a 350 degree oven for about 10 minutes till the cheese melted. Top the tacos with some lettuce, tomato, or any other toppings your family likes and you have a quick meal that is tastier and healthier than fast food! My son is not a fan of beans, but he actually liked the re-fried beans on the bottom of the crunchy taco. My daughter is a picky eater and she ate a whole taco, minus the toppings of course, however she does like avocado, so I did give her some avocado on the side. We did have a few tacos leftover that I wrapped in foil and refrigerated. To reheat place in a oven proof dish and bake at 300 degrees for a few minutes till they are heated through. The tacos were crunchy and just as delicious! Toppings of choice- Lettuce, Tomato, Avocado, Sour Cream, etc. 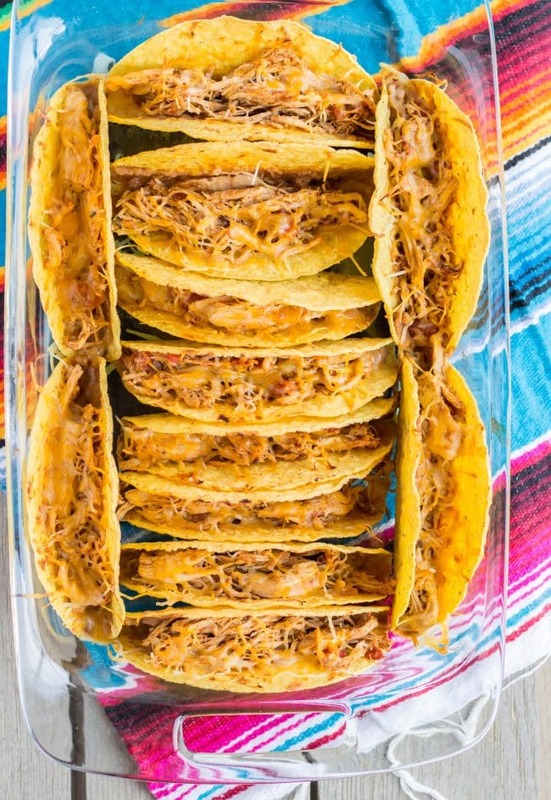 Place store bought Crunchy Taco shells upright in a 9 x 12 Baking Dish, add 1 spoon of canned Re-fried Pinto Beans and spread across bottom of shell. Then add a spoonful of the Salsa Chicken, and top with Shredded Cheese. To Re-Heat, place in a oven safe dish and bake at 300 degrees for about 5-7 minutes until crispy and heated through.